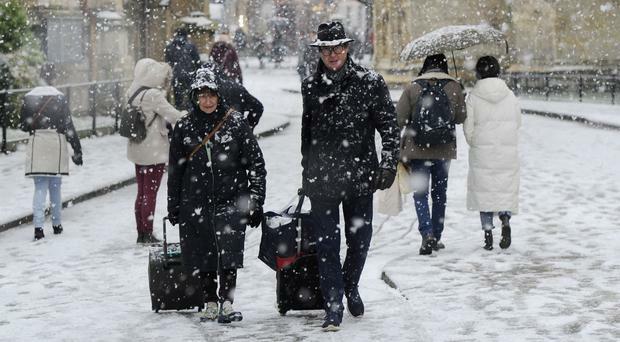 Heavy snow, rain, thunderstorms and wind have caused disruption across much of Britain as the country was gripped by another day of wintry weather. Parts of northern England and Scotland discovered thick blankets of snow on Friday morning, with the south coast lashed by torrential downpours and lightning. Homes were left without power, flights were suspended because of the snow, and damage was caused to buildings by strong winds. Meteorologist Emma Sharples said it was "quite a narrow band of squally conditions" that spread across the south and south west - seeing gales, hail, thunder and lightning cause disruption. Heavy downpours saw roads swamped with water, and trees were felled due to the wind as the weather system made its way eastwards. With reports of power cables down, Western Power Distribution said more than 1,906 homes across the Midlands, south west and Wales were without power on Friday. Further north the rain fell as snow across Yorkshire, the north west, north east and in southern and western parts of Scotland. Glasgow saw the biggest snowfall in the UK, with more than 10cm recorded in Bishopton - forcing the city's airport, one of Scotland's busiest, to temporarily suspend flights. In other areas Ms Sharples said 7cm fell at Redesdale Camp in Northumberland, 4cm in Bingley, West Yorkshire, and 4cm in Spadeadam, Cumbria. A yellow warning for snow remained in place for the northern half of England and into Scotland up until 3pm on Friday. Spokesman Pete Williams said the RAC was "very, very busy across the UK" on Friday morning as a result of the weather, and had been dealing with around one breakdown every 10 seconds. The AA said it had received more than 1,687 breakdown calls before 10am on Friday, with 10 cases of vehicles being stuck in snow. Because of the slippery conditions there were reports of collisions, and a number of roads were closed. These closures included the A6 in Cumbria, the Snake Pass in Derbyshire and the Cat and Fiddle in Macclesfield. Ms Sharples told the Press Association: "Things are markedly improving through this afternoon, temperatures gradually recovering, even across the north. "Across the south much brighter weather, although still showery in places, and snow will mostly become confined to higher ground, although there could still be some hail or sleet. "It will be turning icy tonight." A yellow warning for ice across the north of England and Scotland, which is in place from 3pm on Friday until 12pm on Saturday, has been issued by the Met Office. Meanwhile Ms Sharples warned that Storm Dylan was going to hammer the country from Saturday. A yellow warning has been issued for heavy rain from 6pm on Saturday to 9am on Sunday across much of south-east Wales, plus south western, central and southern parts of England. "With the ground very wet in these areas, this is likely to lead to rising water levels and some flooding in places," the Met Office said. With the precipitation "most likely on Sunday morning", there is a chance of some "very heavy rain" - with up to 25mm likely and up to 40mm in some spots in the space of three hours, the Met Office said. A yellow warning for wind, covering Northern Ireland and southern Scotland, is also in place from around 12am on Sunday to 3pm. The Met Office said there is a "small chance of damage to buildings, with the potential for injuries and danger to life from flying debris". "Large waves and beach material being thrown on to coastal areas could also be a hazard," the forecaster said. "There is a small chance of longer journey times or cancellations as road, rail, air and ferry services are affected, with the chance that some roads and bridges could close. "Power cuts and other services such as mobile phone coverage may be affected."